After an initial dip into a small wash, the start of the path looks fine, if a bit soft. The bike tire track ahead is mine, from an earlier look-see. Saturday, I decided at mid-afternoon to explore an ATV trail I’d seen earlier. 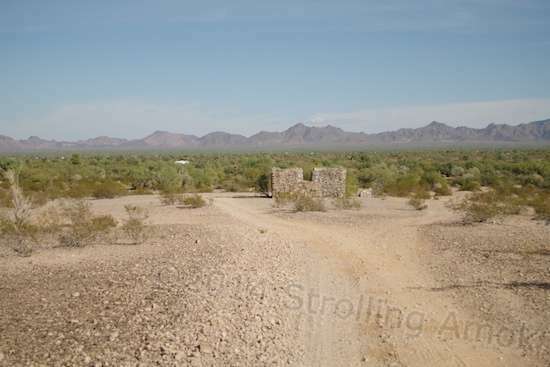 It begins about a mile south of the LaPosa West entrance, along the main trail, Old Yuma Road. 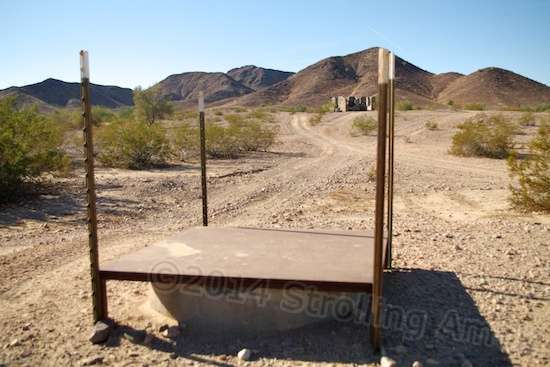 It simply heads down into the main wash at a marked point just north of a set of dumpsters the BLM always has in place. ATV trails are usually too violent for anything but ATVs and Jeeps, but since this crossed a wash, I figured, how bad could it be? 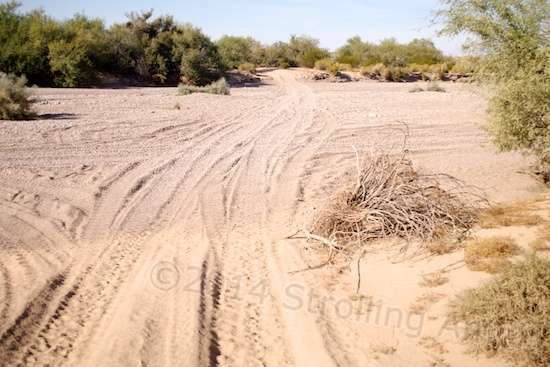 I still had some walk points though, both from steep dips and patches of sand, dust or gravel several inches deep. 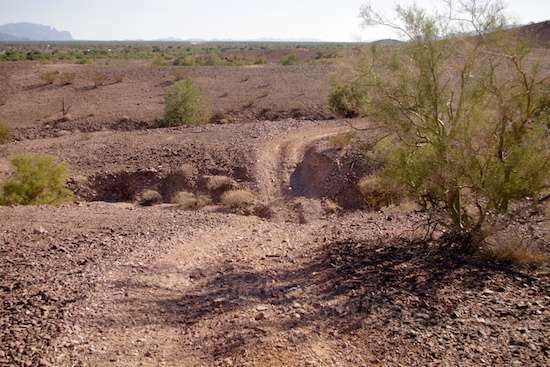 This whole area is a wash, actually, and this is the overflow part of it. 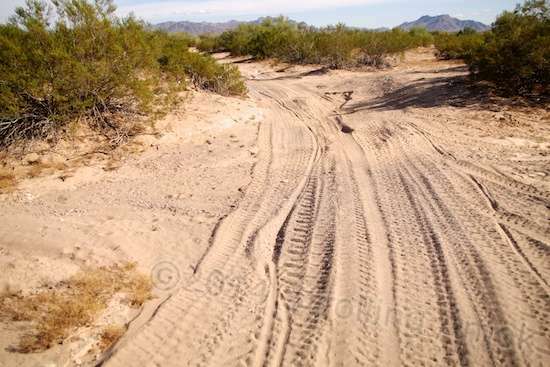 The sand and dust frequently gets thick enough to cause steering loss and a “dig in”. caused by the deep, loose surfaces. It got ridiculous at times, the front tire losing its steering grip and digging in on a swerve, or the back tire sinking in far enough to resemble going uphill in lose slop all the time. The wash proper. Its all deep, loose gravel bordered by very deep dust banks. 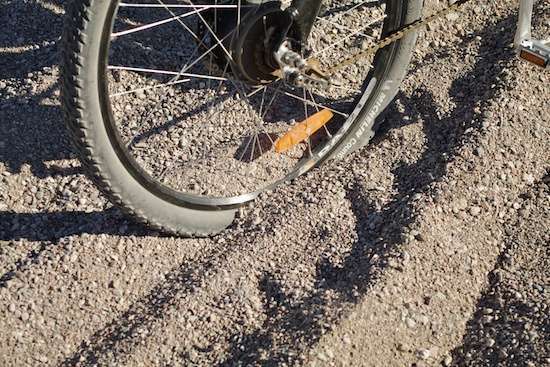 When I recently installed the Michelin Dry Country  tires and self-sealing tubes, along with a set of barrier strips between them, I wasn’t real optimistic about how this would work versus my previous setup of aggressive Maxxis tires with Slime Ultra-Thick Smart tubes. As time has gone on though, I’ve had no punctures so far, and this combo is considerably lighter than the earlier one. The Dry Country tread design is very mild, which has turned out better than I figured. Overall stability on sand and gravel is superior. They will still get overwhelmed by extreme depth, but in these conditions, the only cycle with any chance would be a “fat tire” bike with massive 4″-wide tires instead of the 2″-wide Michelins. Not going to happen. I found my bike less likely to get bogged down by keeping speed up, so that minor steering changes took place over longer distances. This trail absorbed enough power that my smaller 44-tooth chainring proved essential, and an even smaller one would have been handy in a few spots. That’s not going to happen either, as it would make the bike too single-purpose. Surprise! An abandoned cabin, upslope. 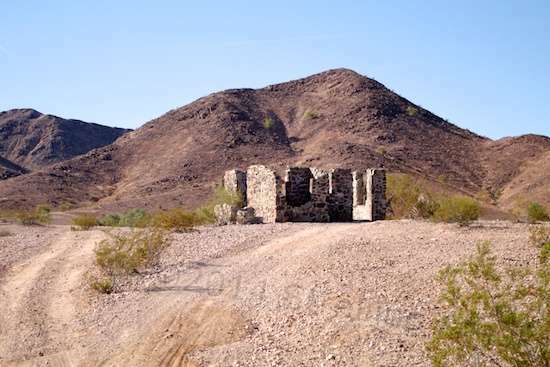 After slogging across the very broad wash, I was startled to see the remains of an abandoned cabin ahead of me. Roof and all wood long gone, this hand-built stone home had touches I would not expect. 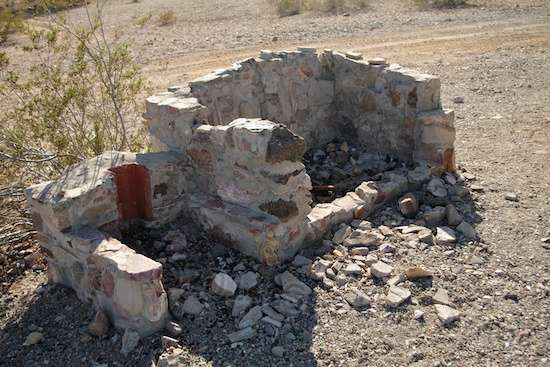 This cabin may perhaps be on some tourist listing for the Quartzsite area. 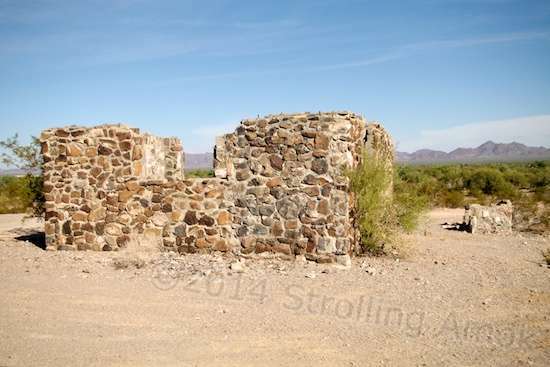 Many of the listings are very vague as to location, and understandably lacking in history. The few hardy folks living here long ago were either miners hoping to strike it rich, or merchants hoping to trade off of successful miners. The native Americans that dwelled her have left far more traces of themselves. This cabin was newer and better-built than the few standing early buildings in the area. I scratched my head on figuring out what these nearby structures were for. Modestly-sized, what first impressed me was that it had been no hovel. Despite its relative inaccessibility, it reflected thought and workmanship. Bolts for beams are still present at the top of each wall, and it’s clear that the cabin has been gutted for its wood. 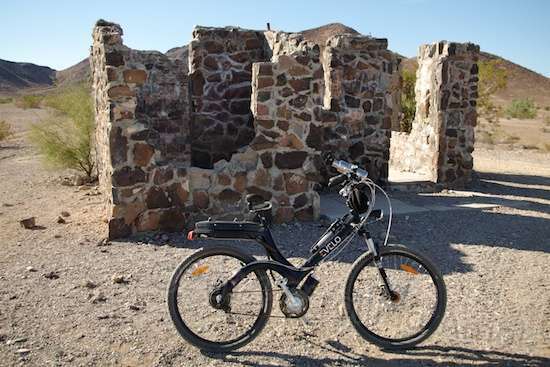 I’m shameless, but I wouldn’t have been seeing this cabin without the e-bike. 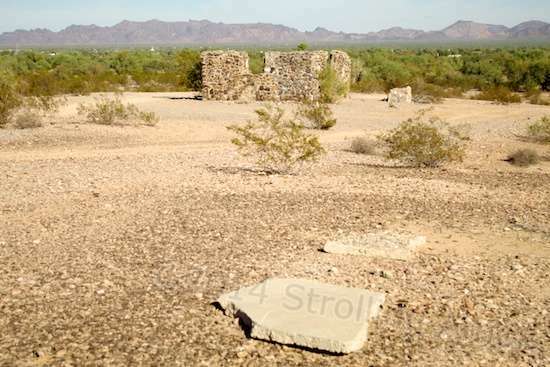 It’s one of those places where, given the smooth concrete floor and the still-viable rock walls, it makes you think “Hey, get a roof back on here and add windowsills back in, and…” but it’s likely this is now federal land too. It had a pretty ritzy stone fireplace, with an oval tile chimney flue and warming cubby. But between the concrete-lined well looking like it’s five years old and the 1954 build date scrawled into the cabin floor, it makes you wonder what happened here. This was once a very nice little cabin, and could have lasted until now, given some TLC. I saw no scorch marks or other signs of disaster. The concrete floor and front porch surprised me, especially since it remains in superb condition. 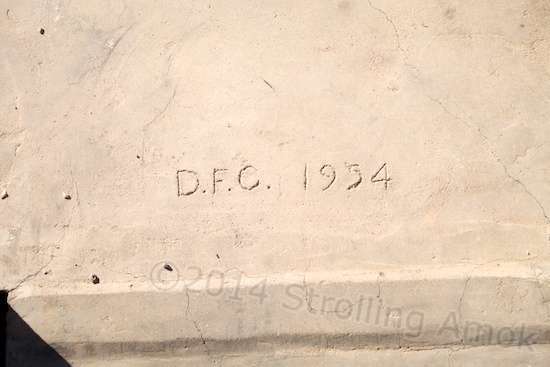 Looks like “DFC” knew what he was doing in 1954. 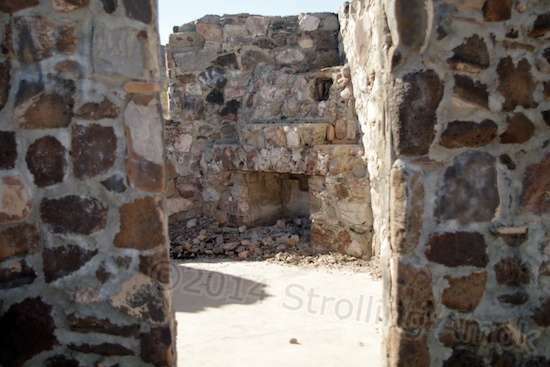 With its choice location on a low hill overlooking a huge, broad valley, its well, its proximity to town and the integrity of its walls still intact, my reaction to seeing this type of thing is, “Oh this is a shame! Not exactly in the ‘fixer-upper’ category, but with no power, plumbing or gas, there’s little to work on but structure.” Am I unique in seeing this kind of thing as a lost opportunity? A shot of the back of the house shows the relationship between structures. Spray paint vandalism is fortunately confined to some of the interior walls, with some idiots wishing to immortalize their names or initials, and others wishing to explore their Artistic Vision with a spray can. On the good side, the cabin walls are so striking that the trashing takes little away from them, instead merely pointing out man’s innate need to conveniently attach himself to something greater than he is, and then point to himself. Unlike petroglyphs left by early native cultures, these have no message, no expression, and no value, being instead a muddled scrap from the spewing of 10,000 monkeys on typewriters. The view out the large rear window is still fab. The trail I had been on went past the cabin and onto higher ground. 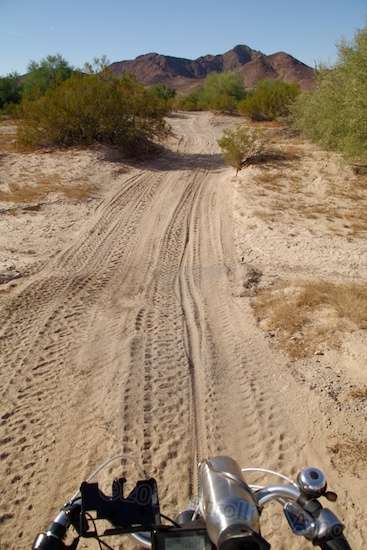 Thanks to modern ATV usage (which is approved in this area), branches took off here and there as the trail wandered. I wondered if any of them had a specific destination – if there was a point to any, other than a way to exercise machinery. I certainly exercised my machinery. The Aurora was now back on solid ground, but some of it was now either very rocky, or very steep and rocky. I hit my limits a few times – a better, more aggressive rider could have ridden over where I stalled – but the bike was pulling 800 watts at times and hopping over loose rocks doing it. My most mystifying mystery: why anyone would bother breaking up and dragging out the front step slab this far away. Terrain like this and the sandy wash do not fall within what I modified the Aurora to be able to do, as it’s nothing but play, well outside the envelope of the duties that it needs to perform for me. It still shows no signs of distress at this kind of abuse, which is a comfort. I mean, the dust here is like tan baby powder, blows around easily in a tire’s wake, and then clings. If you stall the bike on a thick uphill, you can lift just a little weight off the seat on order to paddle your way up, and the rear tire is happy to spin and take much of the work out of it. I’m impressed that I haven’t blown or cooked something yet, ’cause I’m using everything she’s got, and more. The only thing that gets unhappy with this is the Aurora’s disc brakes, which will squeal at light application pressures when dirty. The solution: a periodic squirt of water on each disc to get the dust off. Not the biggest deal in the world, and brake effectiveness is not affected either way. It’s probably appropriate to point out that I’d never make even a small portion of this same trail on a standard mountain bicycle. It’s simply an issue of too deep and loose a surface, requiring too much power. The lesser weight might help avoid getting bogged down, but you’d need to be Hercules with a pumper the size of Seabiscuit’s to go very far along this thing. 2″-wide tires are just not for deep sand and gravel. 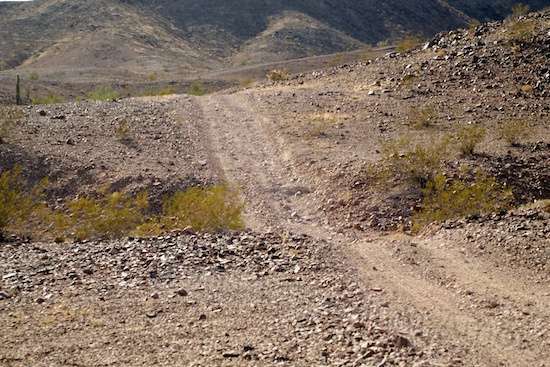 Then on the higher ground, it’s a matter of keeping your balance while the front wheel is dancing over large, loose rocks, uphill, at very low speeds. Very tough going. That I made it as far as I did before deciding to head home represents a trip that otherwise would not have happened at all, if it weren’t for the mid-drive motor system, the larger 500-watt motor, and the smaller chainwheel I had installed for more leverage. 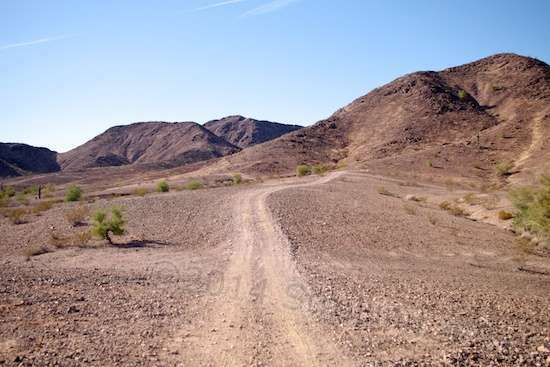 A narrow side trail goes up a hill. I’d call it a burrow trail except I doubt that there are any here. 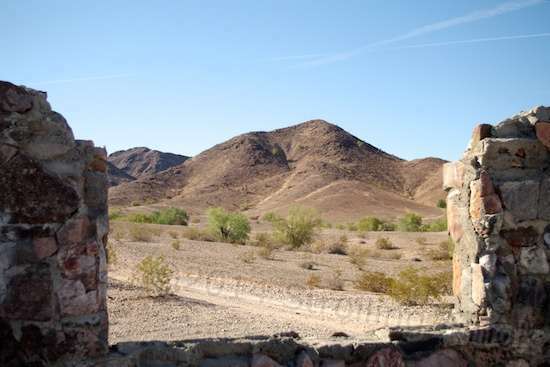 So except for the possible exploration toward Blythe, California, the deepest test for the Aurora’s practical suitability to task won’t happen until I hit the LTVA area near Yuma, in Winterhaven, California. Some of the dirt roads there are a challenge, and proved impractical on the old Raleigh due to slope and traction. So this day’s little adventure was fun and punishing, but means nothing in the great scheme of things other than proving that the Aurora is tough and doesn’t flinch. 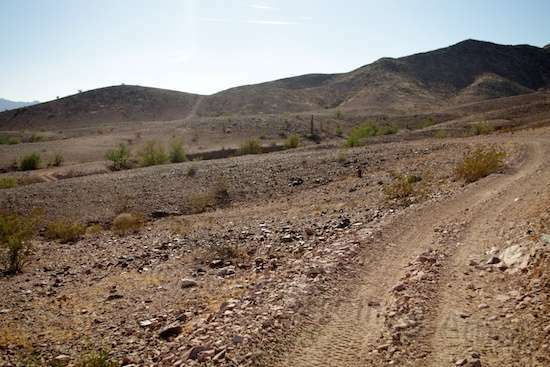 Winterhaven’s lesser challenges are more significant because they will involve real tasks and real cargo loads on roads and slopes that will be longer and more punishing to the machinery overall than today’s 1-mile slugfest. The first big dip and climb looked like a challenge due to sizable loose rocks at the start of the uphill. Nope, the camera is not tilted. 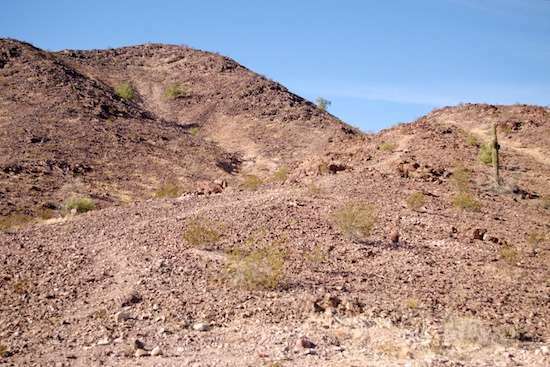 Once past the wash, the trail gets happy as long as you avoid crossing the center ridge unnecessarily. Oops. This wash convinced me to turn around, since it’s definitely a walker, and would turn this impromptu little late afternoon jaunt into a temptation to deeply explore. Returning past the cabin’s backside shows the commanding view if the vast valley below. The well is about 100 yards away, and has been capped over. Crossing the main wash came to an abrupt halt at the start of the opposite bank. No wonder I got stuck! Trying to climb up out of this, and uphill to boot, is a lot to ask. A privilege to walk through, and a punishment to cycle through! Nice adventure. I enjoyed reading your photoblog. Testing limits is a good thing. Now you know what your bike can do if you ever need it to do so. You’re right, Linda. And I’m getting increasing curious about distance capabilities with the trailer, in one shot, and at a reasonable speed. Sinks right in, doesn’t it? I can easily imagine your battle, with typical skinny stroller wheels. One of those situations where you either pull, or make your dog get out and help push too! Thank you, Mr. Scott! You should be able to find past articles detailing my solar setup and reasoning (such as it is). 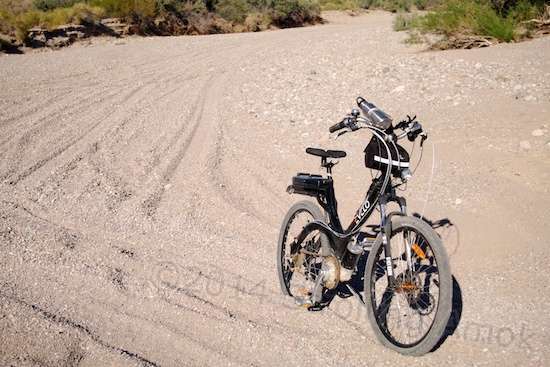 The e-bike thing is ongoing from about August 2014, and should continue for quite awhile. Just select posts from the “Pack Mule” category on the right. I’m close to completing a massive Aurora page dedicated to each of the mods I’ve made, and why, so keep checking back or subscribe!